LONDON, ENGLAND - DECEMBER 02: Protesters gather in Parliament Square ahead of a ‘Die In’ protest on December 2, 2015 in London, England. 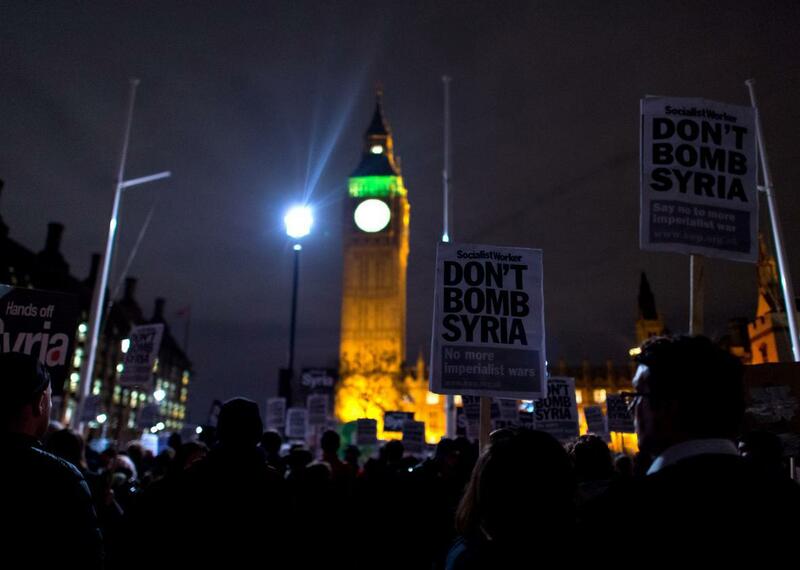 The British House of Commons voted 397 to 223 today to authorize British airstrikes in Syria, and RAF raids against ISIS in the country could begin soon. The motion bars the use of British ground troops in “ground combat operations” and urges the government to take steps to encourage a diplomatic solution to the war in Syria. Britain has been carrying out airstrikes in Iraq for over a year but parliament, particularly the opposition Labour Party, has been wary about extending them over the border into Syria. But the recent terrorist attacks in Paris changed the calculations of many MPs and today’s victory for Prime Minister David Cameron seemed assured after Labour leader Jeremy Corbyn—staunchly opposed to the motion—allowed members of his caucus to vote their conscience on the issue. Sixty-seven Labour MPs voted with the government. The speech certainly makes a strong moral case for confronting ISIS, even if it sidesteps nagging questions about whether airstrikes from Britain or any other country can effectively reverse the group’s gains in Syria or prevent it from organizing attacks abroad. Still, as seen from Washington, where Congress is doing everything it can to avoid formally declaring war against ISIS, it’s oddly refreshing to see a country where the legislature actually has to vote before bombing a new country.